THE MOST INCREDIBLE TRUE-LIFE STORY YOU’LL EVER READ! HE WAS THE AUTHOR OF OVER 170 BOOKS, TRANSLATED INTO MORE THAN THIRTY LANGUAGES. MORE FILMS WERE MADE OF HIS BOOKS THAN ANY OTHER TWENTIETH-CENTURY WRITER…. EDGAR WALLACE, THE ILLEGITIMATE SON OF A TRAVELLING ACTRESS, ROSE FROM POVERTY IN VICTORIAN ENGLAND TO BECOME THE MOST POPULAR AUTHOR IN THE WORLD AND A GLOBAL CELEBRITY OF HIS AGE. HE SCOOPED THE SIGNING OF THE BOER WAR PEACE TREATY WHEN WORKING AS A WAR CORRESPONDENT, BEFORE ACHIEVING SUCCESS AS A FILM DIRECTOR AND PLAYWRIGHT. AT THE HEIGHT OF HIS SUCCESS, HE WAS EARNING A VAST FORTUNE, BUT THE MONEY WENT OUT AS FAST AS IT CAME IN. FAMOUS FOR HIS THRILLERS, WITH THEIR FANTASTIC PLOTS, IN MANY WAYS EDGAR WALLACE DID NOT WRITE HIS MOST EXCITING STORY- HE LIVED IT. 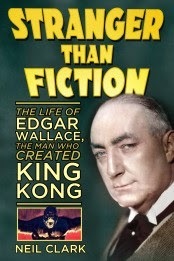 ‘IT IS IMPOSSIBLE NOT TO BE THRILLED BY EDGAR WALLACE,‘ SAID THE BLURB ON WALLACE’S BOOKS. INDEED, IT IS IMPOSSIBLE NOT TO BE THRILLED BY HIS RAGS-TO-RICHES STORY, TOLD HERE IN STRANGER THAN FICTION! Can Labour recreate its election success of 40 years ago? My new politics column for Voice of Russia UK. ......In the previously safe Labour seat of Heywood and Middleton, UKIP came within 600 odd votes of beating Labour. It was very poor result from a Labour perspective- and ironically came on the 40th anniversary of one of the party's most impressive victories- in the October 1974 general election. As Labour licked its wounds in Greater Manchester, BBC Parliament was showing a replay of the election night coverage from forty years ago. I hope Ed Miliband was watching- as there’s lots that Labour could learn from the stance his party took in 1974. If the UK government really sought to keep the nation safe from terrorism, it would stop meddling in the internal affairs of Mideast states instead of hyping the Islamic terror threat, and at the same time, doing everything for it to be in place. Exactly 70 years ago this autumn, British civilians faced a very real terror threat - in the shape of Nazi Germany’s V-2 rockets. While exactly 40 years ago, an IRA bombing campaign brought ‘The Troubles’ of Northern Ireland to the British mainland. What is interesting about the events of 1944 and 1974 is that the government downplayed the threat to citizens, even though the threat of being killed or injured in the violence was greater than it is now. A V-2 rocket attack, for instance, killed 160 shoppers on one occasion. Today though, with Islamic terrorism, the opposite has happened. My latest Public Ownership column for the Morning Star. It’s general election night. Labour are on course for victory, with a small majority. The Labour leader is asked by the BBC interviewer if the size of the majority will hinder his party’s legislative programme. That exchange took place exactly 40 years ago after the election of October 10 1974. Public ownership was a topic that cropped up a lot in that election, but fast forward to 2014 and it’s a very different story. My latest interview for RT. While global attention is focused on IS, the so-called “terrorist threat,” and the US's latest military action in the Middle East, there was a news story this week which really should have been the lead story everywhere in the world. The new Living Planet Report paints an alarming picture of the way the earth's wonderful wildlife is disappearing. Populations of mammals, birds, reptiles, amphibians and fish have declined by a staggering 52 percent in the last forty years. Are British politicans too posh?- and does it matter? Interview on this topic with me here on the Mike Parr show on BBC Tees. Item starts at 10 minutes.